How have I managed in all these years of blogging to have never posted about making paste paper? That's about to change! 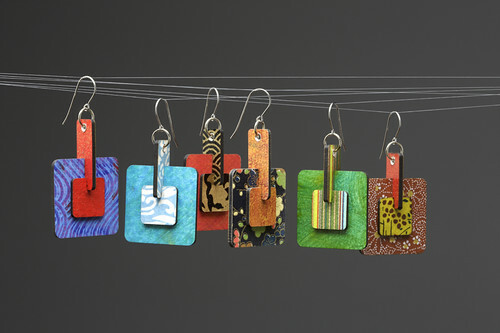 Read on for an introduction to Paper Julep, artist Karen Krieger's line of colorful jewelry that features paste paper, which if you aren't familiar with the term, is the satisfying technique of applying dimensional color to plain paper. 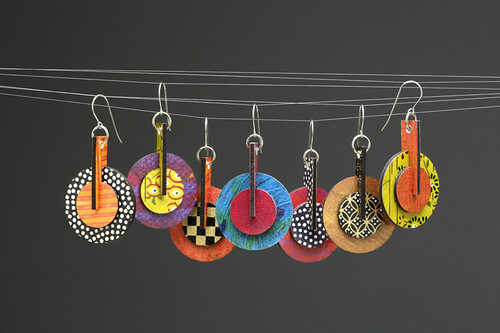 Karen, who lives in Pittsburgh, Pennsylvania, won the recent PCI Paper giveaway, which led to a conversation about the contemporary earrings I noticed on her website. 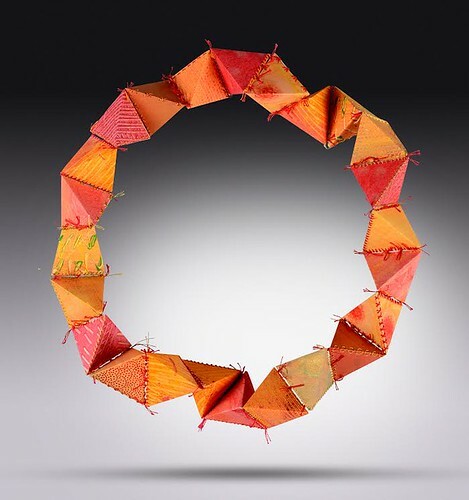 Not only is Karen a professional metalsmith, but for the past decade she has been making jewelry in a variety of geometric shapes with Japanese chiyogami paper and her own handmade paste paper. Karen loves the rich colors and patterns of chiyogami and the ability to create whatever look she desires when making paste paper. 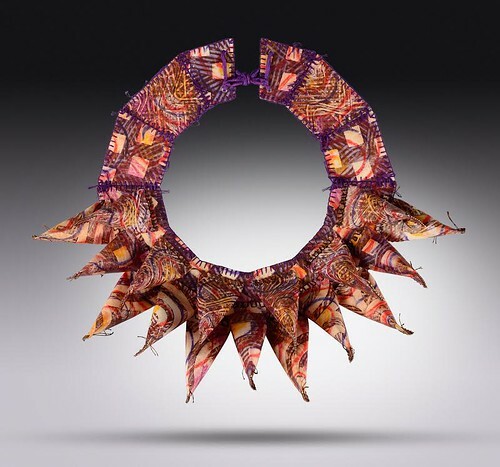 She sent me a few images of her latest jewelry designs that are bespoke pieces made from cut, pierced and embroidered paste papers. To create the necklace above, Karen folded hollow pyramids. Each was stitched separately before they were knotted together to form a chain. Karen says, The stitching is all hand done - no machines for me - that would feel like cheating. She enjoys leading workshops for paper stitching and paste paper, and refers to the latter as finger painting for adults. Sign me up! So how does one make paste paper? You'll find many tips in the paste paper tutorial on Lili's Bookbinding Blog. To complement Lili's information, I asked Karen a few questions about her technique preferences, as well as stitching on paper. What type of underlying paper do you like best? I use Arches text wove or Canson Mi-teintes for colored papers. You can use just about any paper, but I like how these two types hold the pigment and work with pastel. What is your favorite type of paste? My favorite paste is made with Pillsbury Softasilk cake flour. I've tried other flours, but the recipe using Softasilk works best for me. What type of color/paint do you prefer? Acrylic, watercolor, ink, or something else? I tend to make elaborate paste paper which starts with an under-drawing of pastel, followed by multiple layers of acrylic tinted paste. I will also add pigment powders, primarily metallic, and occasionally go back to add more pastel once I've finished the desired composition or effect. 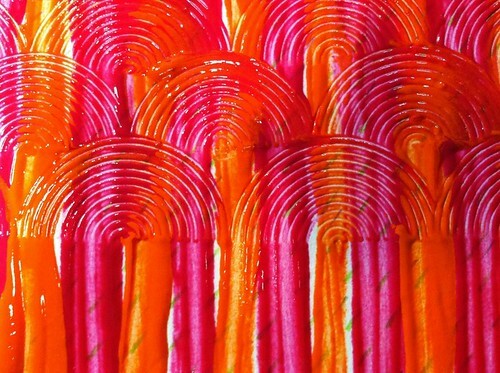 Do you find stitching on paper to be much like working with fabric? The challenge to stitching on paper is pre-piercing the paper in the correct pattern to end up with the stitch you want. Many embroidery stitches will translate to paper, but not all of them. I keep a test strip available if I want to try something new. 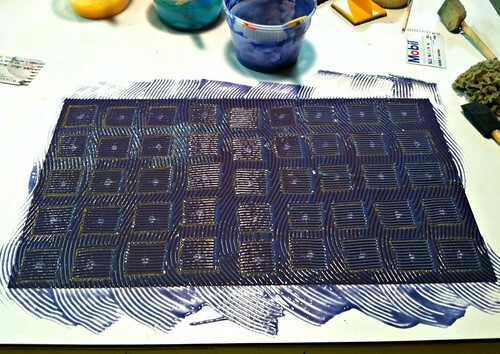 With a simple grid of dots, you can create an enormous variety of stitches. Isn't paste paper too brittle to stitch on? 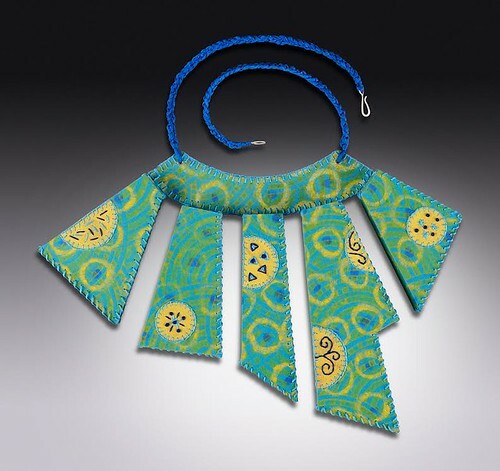 Paste paper is wonderful to stitch on and is the basis of many of my three dimensional neck collars. Occasionally a piece of paste paper will be too thick and will crack a bit when piercing, but that is the exception rather than the rule. Although Karen mainly makes sterling silver pieces for her Etsy shop, Karen Krieger Metals, she will be adding paper jewelry in the coming weeks. 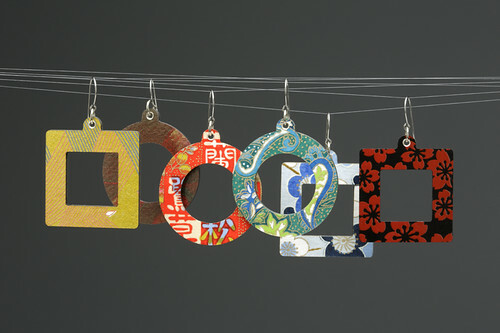 Her earrings are currently sold in boutiques, museum stores, and fine craft galleries throughout the United States. You can contact Karen via Paper Julep to inquire about the closest store to you. Her next craft show is this coming weekend, October 11-12, at Artists’ Market, part of the Plein Air Mt. Lebanon Festival in Pittsburgh. Oh, the earrings! What fun these pieces are. Wow, this work sounds time consuming! 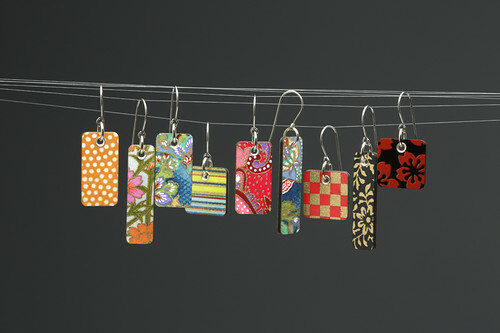 I had never heard of paste paper or paste paper jewelry. Lovely. What a neat technique! Her earrings are beautiful. What an amazing artist! Thanks for this awesome find. I will share at some point! Hi Pearl! Thanks for sharing, that would be great. Beautiful and the colours so vibrant. Thanks for the tutorial link Ann, learnt so much . How do you get such precise shapes? I love the rounded squares. Is there a secret?